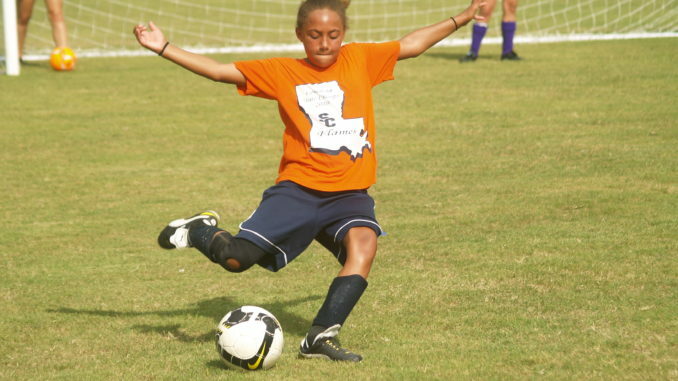 Challenger Sports will hold one of their popular “British Soccer Camps” in Destrehan. St. Charles Soccer has teamed up with Challenger Sports to host the week-long camp from June 23-27 at the Shriners Field on Ormond Boulevard. The camp will run Monday through Friday and each child will be coached by a member of Challenger’s team of 1,100 British soccer coaches flown to the USA exclusively to work on these programs. Challenger Sports will hold more than 3,500 soccer camps this summer and will coach more than 130,000 players between the ages of 3 and 19. Challenger’s new 1,000 touches coaching syllabus provides an innovative daily regimen of foot-skills, moves, juggling, tactical practices and daily tournament play. Challenger also weaves lessons on respect, responsibility, integrity, leadership and sportsmanship into the camper’s daily routine. The British soccer camp program also provides a unique cultural experience for the players, highlighted in the Camp World Cup. The coaches use this daily tournament to teach the players about life, customs and traditions of other countries. The campers are asked to make up soccer chants, wear the team colors of their country, bring flags and learn as much as they can about the country they represent. •Ages 5-6 (Mini Soccer) from 9 a.m. until 10:30 a.m. Cost is $86. •Ages 6-16 (Half Day) from 9 a.m. until noon. Cost is $115. •Ages 7-18 (Half Day Advanced Camp) from 5 p.m. until 8 p.m. Cost is $115. Teams are also welcome to attend and receive a week of focused instruction to prepare them for the fall season. Each camper will receive a soccer camp T-shirt, a soccer ball, a giant soccer poster and a personalized skills performance evaluation when they register. Space is limited and parents are encouraged to sign up online in advance. Registration forms can be found at www.challengersports.com.